69/92 David Mumpower Van Helsing goes to show that even the best concept can be turned into one of the worst movies of all time. 113/126 Kim Hollis Awful music. Awful script. Awful acting. Just plain awful. For those unfamiliar with the name, Van Helsing is the vampire hunter who matches wits with Dracula in Bram Stoker's oft-adapted novel. With Universal's announcement that this film will be their tent-pole May release for 2004, it looks like the old man might just be in line for his very own action/adventure franchise. Of course, old man is a relative term. Though the character from Stoker's novel and most of the Dracula film adaptations is, in fact, an elderly gent, it certainly appears that for this fanciful adaptation, audiences will be seeing a Van Helsing of the hunkiest sort. Hugh Jackman, perhaps better known as Wolverine, stars in the film and while purists may scoff at the notion of having someone so young and attractive playing the part, the idea is actually ingenious. 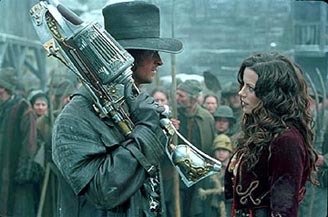 If Van Helsing truly has amassed plenty of hours battling the undead, doesn't it make sense that he would have honed those skills as a young man? Adding to the fun, our hero's encounters won't be limited to Dracula alone. Many of the classic Universal movie monsters will be featured, such as Frankenstein's Monster and the Wolf Man. It seems our hero has been sent to a mysterious land in Eastern Europe to eliminate these evil forces, and once he arrives, finds that he will be assisted by the insanely hot Anna (Kate Beckinsale), whose family has long been committed to the destruction of the evil Dracula (Moulin Rouge's Richard Roxburgh). Even Dr. Jeckyll and Mr. Hyde will get some play in the tale.